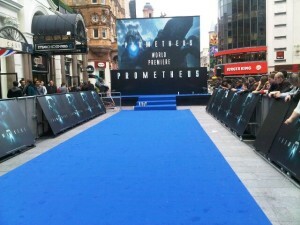 The official Prometheus premiere will take place this evening at 5PM UK time (9AM PST / 12PM EST). The cast and crew will be walking down the red carpet and we will be able to watch it all online at: http://www.live.prometheusmovie.com. Meanwhile, you can find a few pictures below that show the premiere. Guys, is anyone posting the T4 Prometheus Premiere Special? I'm sure he's a member here or something. I've seen him! I swear it! btw, great pics tp3000! a lot of them are focused from the interviewer's POV, are you a cameraman? AhhaaAHAAAA rogue sweet jesus, that was too much first thing in the morning.